Here in our comfy house in a safe, normal neighborhood it’s tempting to over emphasize the need to improve our surroundings with this house. This shower head is a perfect example. See, I could exaggerate a bit and tell you that the old shower head provided the WORST SHOWER I’VE EVER HAD. But that wouldn’t be true. I’ve had worse. Much. Worse. The Kickapoo Motel in Shawnee on my first day of school at OBU. 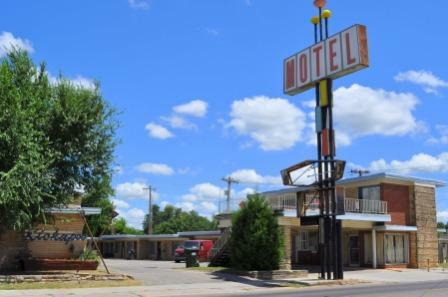 It’s the kind of place that tripadvisor doesn’t bother listing because you can’t even get a room for the whole night. They only rent by the hour. The main problem with this shower experience was the green fungus growing in the tub. And the busted bathroom window that had been boarded up with a Coca-Cola 12 pack cardboard box that had since decomposed due to moisture. That two-foot square hole in the wall was letting in all kinds of wind. The Idaho cabin “shower.” In my teens, my family owned a “cabin” in the Idaho panhandle about 30 miles from the Canadian boarder and about 5 miles from the nearest maintained road in a patch of lush evergreen forest. How secluded was it? Our neighbors where a camp of ex-military isolationists who loved to run “domestic anarchy drills” with live ammo at night. True story. Were they hoping to survive impending anarchy or create it? I never really asked. It was at this “cabin” that I learned important lessons like: how to construct my own solar shower using black plastic trash bags and PVC pipe. Another true story. A gasoline powered pump surfaced water through a garden hose at 33.5 degrees F – that’s a degree and a half above freezing. Without electricity or bathroom facilities, showering involved carrying a bucket of freshly pumped water into a private corner of the woods, ladling the smallest amount of water possible over your head to lather shampoo while teetering atop a tree stump to keep your feet from getting muddy. That far north, summer highs topped out at about 60, so wind chill was always a problem. And with your hands going numb, it’s always hard to tell if you’re actually working up a soapy lather, or just grinding the dirt further into your scalp. I didn’t even try to shave that month (see #1). My homemade solar shower raised the water temp by 5 degrees. But still. That’s what I call northern exposure. Talk about shrinkage. The moral of the story is, to be grateful and content with what God has given me right now, I have to remember what I need and how that is different than what I want. Sure, this new shower head is great. But all you really need for a shower is a plastic cup. And maybe a tree stump to keep the mud off your feet. Who knows? With an attitude like that, you might keep yourself from wanting more. You may even find yourself wanting less. Gratitude can be it’s own reward. Just the same. I do like my new shower head. And by thinking back to my three worst showers ever, I’m grateful for it, too. Kickapoo Motel, African Safe House, or Northern Exposure. If you had to choose one of those showers, which one would you pick? This entry was posted in photos, reflections, wildlife. Tagged communication, gratitude, idaho, oklahoma, shawnee, showers, worst, zimbabwe. Next Post Next post: Can you tell if someone’s smart by just talking to them? You were an impressionable 15 years of age when you went to Zimbabwe, pretty young to see ‘real’ life. Dad and I were so proud of your desire to go and delighted of how God provided for you to do something so ‘adult-like’ while still a youth. You were used mightily by God on that trip. We feel you did some growing up there too, no doubt the bathroom and food experiences contributed! All that and without your parents! But..Dad still laughs at your shared experience in the Kickapoo. I never did find the humor you and Dad have shared over staying in ‘that place’ together. With it being your first time off to college and me being a complete mess with you, my first-born being gone, I consider not sharing the Kickapoo Motel experience with you and Dad as an absolute blessing! This experience tops any hotel stay Dad and I have shared – hands down! As to Idaho, I vouch for every word of your description. I remember you and your younger brothers having a contest to see who could hold their heads under the water hose the longest. It seems a very few (can’t remember just how few) seconds under the hose produced a numb head or who ‘won’ but I do recall the laughter and blue lips! We tried to wash clothes in that old rattly washing machine we had strapped to the duly or was it the truckbed trailer we pulled up there? We filled it up using said hose and no matter how much detergent we used the clothes came out as just as sandy as they went in. Eventually we surmised the arctic cold wash/rinse cycles didn’t allow for proper sand removal so we became accustomed to sandy towels, socks and clothes. In the evenings I read aloud from Uncle Tom’s Cabin, our standard evening family entertainment. The first ‘real shower’ night, the reading happened to be a particularly tragic chapter but we had broken out in laughter which became uncontrollable and eventually almost hysterical. Everything was just SO funny!! By the time we started getting headaches you came out of the shower, surveyed the situation and announced that we were all under the influence of the gas. Dad unplugged the gas, we opened windows (brrrrr) and you boys headed to the out building which was your sleeping quarters. What a headache we had for a long time! Dad and I laughed for hours but had to wait a few more days to get our hot shower, but hey, we have memories! Thinking back to those times, I’m still endeared of how you jumped in time and time again, undaunted by the huge challenges that definitely abounded at that cabin, the 25 acres it was on and the ‘interesting’ neighbors we had on either side. Even Switzer Mountain with it’s history looming in our direction was a bit ominous. You took it all in stride, even the large moose, bears that enjoyed our blackberries and the endless ‘remodel’ projects. You were brave enough for both of us. I thank you for that! Perhaps we all grew a bit from all those experiences. Owen, your blog takes me back to days preparing for News30, listening to you telling stories during breaks, then trying to keep a straight face while saying “Wes Watkins Water Reservoir.” on the air. I’m not sure whether I enjoyed reading this post more or your mom’s response. Thanks for the reminder about gratitude. My wife and I are looking for a home and the lesson fits the occasion. Of your three experiences, I’d definitely choose Northern Exposure. A stump seems like a much cleaner place to plant your bare feet. Ah, News30. Good times! Hope the house hunting is going well. What a process that can be!